Posted December 30th, 2010 by admin & filed under Air Conditioning, Heating. As the temperature of you your home changes, the thermostat operates the furnace and air conditioning system to bring the home to a desired room temperature, this is known as a furnace cycle. When your furnace operates “on then off ” for only very short periods of time, it is known as short cycling. Short cycling will not only decreases energy efficiency, but can potentially be a sign of a serious problem within the heating and cooling system. Most times a furnace will short cycle due to a lack of airflow. One of the most common causes for reduced air flow is a dirty furnace filter. Replace the furnace filter with a new furnace filter and get into the habit of changing the furnace filter every two months that the furnace is operation. If the short cycling of your furnace has occurred after recently changing your furnace filter it may be a result of using a filter that is too restrictive to airflow, make sure to use filters that are recommended by your specific model and brand of furnace. If the air filters are getting an excessive amount of debris build up consider having the air ducts cleaned to lesson the volume of debris impacting the HVAC system. Sometimes home decor can negatively impact the functionality of the HVAC system. Another cause for airflow restriction may be blocked air vent registers, inspect the air vent registers for items that may be blocking airflow. Located above the furnace is a set of evaporative air conditioner coils which is responsible for absorbing the heat from the air. If the air conditioner coils have debris blocking airflow, it can cause the furnace to short cycle in both the cooling and heating season. Thermostat location can often times cause short cycling. To ensure proper operation, a thermostat should be mounted on an inside wall in a frequently occupied area of the home. Thermostats need to be away from drafts, the effects of windows and radiation from windows and outside walls. Try temporarily shielding the thermostat with a piece of cardboard or paper, if the short cycling stops a draft is causing the problem, contact an HVAC contractor to discuss moving the thermostat to another location. Short cycling of furnaces can also be caused by the furnace overheating. 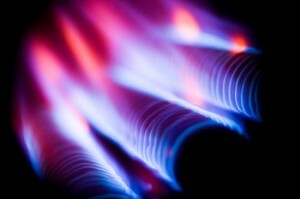 Most modern furnaces often have safety devices which monitor temperatures. Short cycling can occur when the heat exchanger overheats and the burner automatically shuts off to prevent damage. In rare circumstance it can be a crack in the heat exchanger, which causes the short cycling. If you feel that your furnace is short cycling due to overheating, turn off the furnace and contact an HVAC company for repair.